The gluttonous King Dedede has stolen all of the food from the inhabitants of Dream Land for a midnight feast, so Kirby, a resident of Dream Land, goes to retrieve the food and stop Dedede. 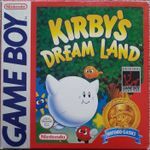 Kirby's Dream Land operates similarly to other platformers during the 8-bit and 16-bit era of video games: Kirby must use various natural abilities and occasionally external abilities or items while heading toward the goal at the end of each level. Like many 1980s-era platformers, the player can accumulate points, with an extra life granted once the player has enough points. However, because Kirby lacks a save function, scores are not recorded. All levels are played on a two dimensional plane, allowing the player to move only left, right, up, and down. Kirby's movements include basic ones such as walking and jumping, but also including the ability to fly indefinitely. Kirby may also inhale enemies to either simply defeat them or to use them as projectiles. Source: Wikipedia, "Kirby's Dreamland", available under the CC-BY-SA License.